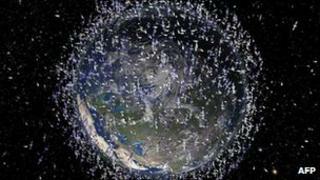 Scientists in the US have warned Nasa that the amount of so-called space junk orbiting Earth is at tipping point. A report by the National Research Council says the debris could cause fatal leaks in spaceships or destroy valuable satellites. It calls for international regulations to limit the junk and more research into the possible use of launching large magnetic nets or giant umbrellas. The debris includes clouds of minuscule fragments, old boosters and satellites. Some computer models show the amount of orbital rubbish "has reached a tipping point, with enough currently in orbit to continually collide and create even more debris, raising the risk of spacecraft failures," the research council said in a statement on Thursday. Hopes of limiting the amount of space junk in orbit suffered two major setbacks in recent years. Two years later, two satellites - one defunct and one active - crashed in orbit, creating even more debris. There are 22,000 pieces of debris large enough to track from the ground, but smaller objects could still cause serious damage. The International Space Station must occasionally dodge some of the junk, which flies around the Earth at speeds of up to 17,500 mph (28,164 km/h). Media captionDr Robert Massey, Royal Astronomical Society: "It is a serious issue"
In June, some debris narrowly missed the space station, forcing its six crew to go to their escape capsules and prepare for an emergency evacuation back to Earth. The situation is critical, said Mr Kessler, a retired Nasa scientist, because colliding debris creates even more of the junk. "We've lost control of the environment," he said. The report makes no recommendations about how to clean up the field of debris. But it refers to an earlier study for the Pentagon's science think-tank, the Defence Advanced Research Projects Agency (Darpa). The Darpa report, dubbed "Catcher's Mitt", suggested a range of technologies, including harpoons, nets and an umbrella-shaped device that would sweep up the debris. The aim would be to push the debris further towards the earth where it would burn up, or into a higher but safer orbit.